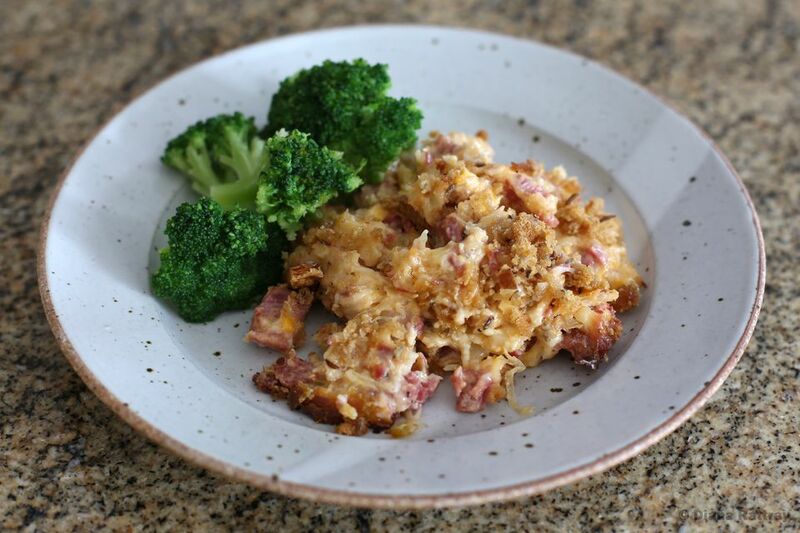 This Reuben casserole is another great way to enjoy leftover corned beef, or buy a chunk at the local deli. Serve this tasty and hearty casserole with a fresh salad or sliced tomatoes. The casserole is made with the ingredients you would find in a classic Reuben sandwich, right down to the rye bread and Thousand Island dressing. You'll enjoy the Reuben sandwich flavors in this convenient, one dish meal. Spray an 8-inch square (2-quart) baking dish with nonstick cooking spray. Heat oven to 350 F.
Dice the corned beef and put it in a large bowl. Put the sauerkraut in a colander and rinse it thoroughly under cold running water. Squeeze out as much of the moisture as possible and transfer it to the bowl with the corned beef. Add the grated onion to the bowl along with the Swiss and cheddar cheeses, Thousand Island dressing, mayonnaise, and freshly ground black pepper. Stir the mixture with a spoon or your hands until well blended. Spoon the corned beef and sauerkraut mixture into the prepared baking dish and spread or pat it evenly. Tear the rye bread into small pieces and put it in a food processor. Pulse until the crumbs are fine. Put the crumbs in a bowl and toss with the melted butter until they are well coated. Sprinkle the crumbs over the casserole. Bake the Reuben casserole in the preheated oven for 45 minutes, until topping is browned and filling is bubbly. If you use canned corned beef, refrigerate the can until the beef is thoroughly chilled. It will be firm enough to dice and use in the recipe.